I study directing. For me directing is a stage of writing, as well as a teamwork with all the other subjects involved (light designer, set designer, costume designer, choreographer and also with stage playwriting). For me, the text grows together with the other scenic languages and is verified through the work with the actors. 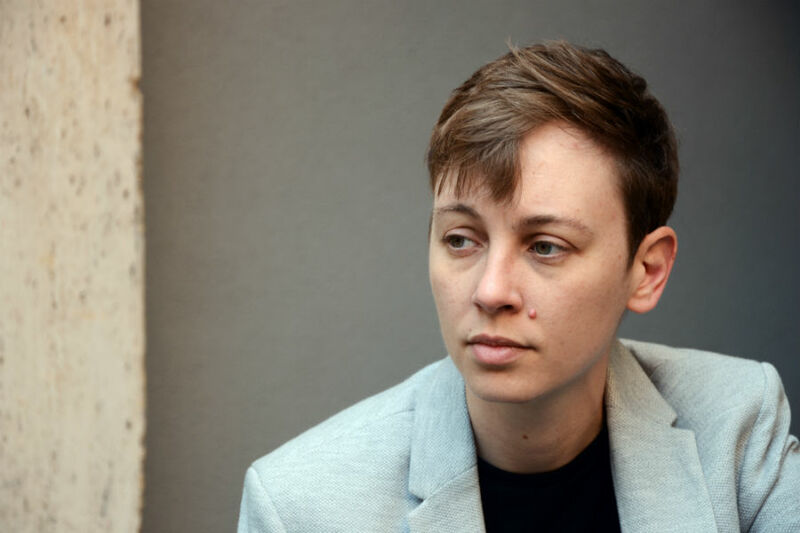 Liv Ferracchiati (Todi, 1985) graduated in Literature and Philosophy from Literature, Music and Performances at La Sapienza University in Rome and in Theatre at the Civica Scuola di Teatro Paolo Grassi in Milan in 2014. After attending drama and director’s workshops, in 2013 he debuts at Teatro “Franco Parenti” in Milan with Pulp Hamlet written and directed by him; in 2014 Sulla Sabbia of Albert Ostermaier, with him direction, is premiered at Piccolo Teatro Studio in Milan, winning the award “A Window on German dramaturgy”, created by the Dramatic Art School “Paolo Grassi” and supported by the Accademia di Brera, Goethe-Institut. In 2015 he founds The Baby Walk theatrical company; the same year he is at the Terni festival with the preview of Peter Pan guarda sotto le gonne – Trilogy of Identity (Chapter I), playwriting and direction by Liv Ferracchiati, about the youth of a Transgender, a performance rewarded at the National Young Theater Prize. In 2016, always at the Terni festival, he premieres her Todi is a small town in the centre of Italy, (text and direction by Liv Ferracchiati), a production of Teatro Stabile dell’Umbria. In June 2017, her Stabat Mater – Trilogy of Identity (Chapter II), wins the Hystrio Award Scriptures of Scene 2017, while in July, Un eschimese in Amazzonia – Trilogy of Identity (Chapter III), written, directed and played by him, wins the Scenario Award 2017. In August of the same year, Stabat Mater has its national premiere at the International Theatre Festival in Venice. The play is also selected for the International Theatre Festival 2017 directed by Antonio Latella along with Todi is a small town in the centre of Italy and Peter Pan guarda sotto le gonne. Peter Pan looks under the skirts, the first chapter of the “Trilogy of Identity”, talks about the infancy of an eleven year-old, born in the 1990’s a female, focusing on how transgender issues can assume the semblance of spontaneity and even tenderness. While he is playing ball, he meets Wendy, thirteen years old. The girl causes him distress and gives him a chance to become aware of himself. The inability to give voice to their desire for identity and love will bring Peter to repress himself, despite the advice of the fairy Tinker Bell. The core theme of the play is the impossibility of communicating, but also growing up and the discovery of the first sexual impulses and the confrontation with the parents. Stabat Mater, the second chapter of the “Trilogy of Identity”, is the story of a thirty-year-old, an ordinary writer who is experiencing an extraordinary situation: to live as a man in a woman body. It is a play about the emancipation from the mother, the difficulty of becoming adults and building one’s own identity without adhering to predetermined patterns. Andrea is a self-confessed seducer, engaged in long-standing cohabitation, but the encounter with a psychologist will bring him back to life. Stabat Mater has won the New Scripture 2017 Hystrio Award.